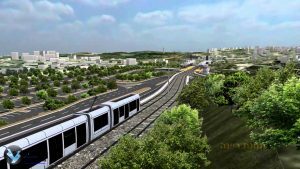 Cross-Israel Highway selected Ineco – Yenon Research and Design joint venture for the Haifa-Nazareth light rail project planning. EUR 78.34 million (NIS 320 million) is the value of the contract. The Haifa-Nazareth LRT project envisages the construction of a 41-km system served by 19 stations, as well as the creation of park and drive parking lots, a depot, and a control center. The total value of the project is EUR 1.7 billion (NIS 7 billion). In 2018, Cross Israel Highway published the tender to manage the project. Dana Engineering won the management tender, together with Spanish company Idom, and entered the project a month ago. After two years of planning, the tenders for construction of the railway will be issued in 2021, with the railway scheduled to begin operations in 2027. The LRT will be operated by 32 trainsets that will travel on the new line with a maximum frequency of one train every four minutes. A maximum of 10,620 passengers an hour is projected with a planned speed of 100 km/h on the interurban section. The line will serve residents of the north and connect metropolitan Haifa with the Nazareth-Upper Nazareth municipal area. The project combines an interurban public transport system and a municipal mass transit system. The tram-train technology will facilitate travel on both the interurban and municipal section with no need to switch trains.